Which of the Manfrotto monopods is the best one for you? There is good news for you if you're searching for a monopod made by Manfrotto. You've got plenty of options at different price levels. This article will help you decide if a Manfrotto (formerly sold as Bogen) is a good choice for you to pick to support your camera. Manfrotto Monopods and Bogen Monopods. The names are synonymous with high quality and excellent reputation. I purchased my first "professional" tripod while in photography school in the early 1980s. It was a Bogen and that was the name that everyone at school talked about for tripods and monopods. Bogen Imaging, owns the Manfrotto brand and changed its name to become Manfrotto Distribution in January of 2010. Manfrotto is owned by International Vitec Group which also has the prestigious brands of National Geographic and Gitzo. Model 344B is one of the most intriguing of the Manfrotto-Bogen monopods. It was originally marketed as the Bogen 3245. It is an automatic, 3-section, monopod that allows you to adjust the height with a single hand. You can squeeze the trigger handle and raise or lower the top section. When you release the trigger, the monopod locks into position. The two lower sections can be adjusted with the typical twist-lock mechanism. As with most European monopods, both the 1/4 and 3/8 inch mounting threads are available. It does fit into a medium-sized suitcase for traveling and is surprising light for what it can support. It is intended for heavier camera-lens loads and is definitely overkill for a point and shoot digital camera. For a photographer over 6 foot tall with a tilt-head or ball- head attached, it is plenty long enough. The 679B got an average 5 star rating by 42 customer reviews at Amazon.com. This is extremely high when you consider that often dissatisfied customers tend to give feedback and opinions on products that they have purchased. This model is one of the best monopods because of its weight of less than 1 1/2 pounds, and its load capacity of over 20 pounds. This is a three section monopod with the standard sure rubber grip and wrist carrying strap. It has a nice big camera-head platform with a plastic cover and the 1/4 inch and 3/8 inch multi-sized camera mounting screw. As with other Bogen-Manfrotto monopods and tripods it is well made and of the highest quality. The main difference in Model 680B, described below, is that its minimum length is less than the 679. The 680B is thicker and heavier than the 679, and could be slower to set up if you are in a hurry, because of the extra section. The Manfrotto monopod Model 680B replaces the Bogen Monopod 680. The 680B is a 4 section tripod and uses the flip levers to lock the monopod legs into position. Monopods of this quality are more substantial and much easier adjust to full extension than the cheapo, small monopods you see at discount stores. The Manfrotto 680B Monopod is one of the most popular Manfrotto monopods in terms of customer ratings as well as the number of them sold. This model is very popular with video photographers. It's not the lightest weight monopod on the market but it's one of the sturdiest. The 682B comes from the Classic line of Manfrotto monopods. The 682B comes with detachable legs, which can make the combination heavier than some carbon fiber tripods. Monopods with the three small leg feature are really an interesting "in-between" piece of camera equipment. Having more stability and weight than monopods, they are smaller, lighter and easier to move about quickly than tripods. Using the detachable legs also takes away the advantage of having this piece of equipment double as a monopod walking stick. The three legs do add stability, but with the price of the extra weight. It is promoted as the fastest monopod in the world. If you get a chance to use one of these engineering marvels, you'll understand the claim. It has an innovative opening mechanism that involves no levers, knobs or screws. Closing it involves a simple release of a safety latch and a pull on the trigger. 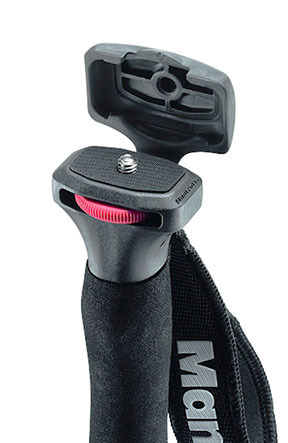 There is also a rubber pedal that lets you open this Manfrotto monopod without using your second hand. The legs are constructed to prevent water or dirt from entering the tubes. This is a great feature for nature and beach photography. Another great feature is the insulating pad that keeps your hand comfortable in cold or hot weather. To avoid the hassle of buying a cheap monopod that will leave you disappointed in the end and to feel and look like a pro photographer, go ahead and take the right step to getting the right tool for the job: Manfrotto-Monopods. A new Manfrotto offering was recently introduced called the Off Road Collection. These off road photographic walking poles have a very unique feature. They're principly a standard pole made for hiking, but they have a rather unique added feature. At the very top of each monopod is a little lid that flips up out of the way and reveals a standard 1/4 digital camera mount. These new monopods are part of several new products that Manfrotto has announced as part of a series of accessories aimed at photographers who like to combine hiking and shooting. This may be a little too gimmicky for some, but give Manfrotto some credit for being innovative! More importantly, unlike the traditional camera monopod, the new Manfrotto sticks are designed to be a sturdy accessory, appropriate for safe hiking on rough terrain. These sticks are less than a pound and a half which make them the lightest that Manfrotto offers. I'm not so sure they've become very mainstream. Both Adorama and Amazon no longer offer them on their websites, although I did see one listed on ebay. How to Use a Monopod . Tips on getting the best results by using a monopod the right way. Avoid the photo mistakes that many photographers make and discover how to use a monopod correctly. Monopod Tips. Here is short video covering 3 reasons on when using a monopod makes sense and 4 more ideas on how to use Manfrotto monopods (or any brand for that matter) to get great photos. Slik Monopods - Reviews. Over the last 50 years of manufacturing monopods, Slik has won several awards and the designs have been copied and become know as industry standards. Opteka Monopod Reviews. Monopod reviews of the Opteka line, very affordable and great for point and shoot cameras. Gitzo Monopods. Gitzo is at the high end of the scale when it comes to price and reputation for buying and using monopods. 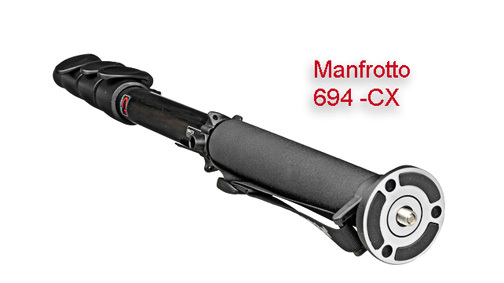 The Manfrotto 694CX Carbon Fiber is a 4-Section Monopod that is compact and lightweight. It combines the strength of magnesium and carbon fiber. Manfrotto made this monopod from carbon fiber, using a patented process. Elongated carbon fibers are combined with resin under high pressure to produce a strong tube that absorbs more vibration with a thin wall thickness. All aluminum components were replaced with magnesium. That change keeps the sturdiness the same but adds strength and reduces the weight. The weight is reduced by about a third when aluminum is replaced by magnesium. Monopod reviews on the top on-line, professional photography, retail web site of the Manfrotto 694-CX averaged a rating of 4.8 out of 5.0 stars. This is impressive considering the high level of expectations buyers on this site have. You can read more reviews from buyers of the 694CX monopod as well as other Manfrotto Monopods here: Manfrotto - The 694-CX Monopod. You can get more general information directly from Manfrotto here: Manfrotto Monopods. Manfrotto monopods in general are well made and have a variety of features that are useful for the amateur as well as the professional photographer. You can budget your purchase by searching using the term "best Manfrotto monopod under $100" or something similar for your own price range. Buying your monopod from one of the vendors below helps me take care of my growing family. I appreciate your support.